2011 was a very tough year. A lot of big things had run their course and came to their ends in 2011 - a job, a business, a relationship. But there was always yarn to keep me company and hold me up through it all (it is remarkable how much support something so soft and pliable as fiber can provide). 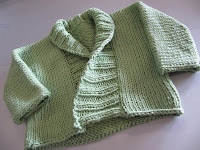 In 2011, I finished 32 projects, plus one sweater that was completely frogged, for a total of 33 projects! That is a crazypants number of projects! Some of them were very tiny, and I only have pictures of about 2/3 of them, because I've been terrible about getting snapshots, especially of the smaller ones (which tend to get gifted way too quickly). I think one of my goals for this next year will be to be better about photographing my FOs. 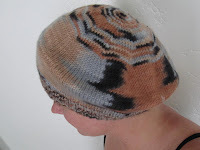 More details on each of these can be found on my Ravelry page. 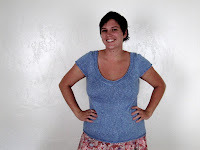 One of my goals was to make more summer-wearable tops for myself, which is definitely something that I achieved! 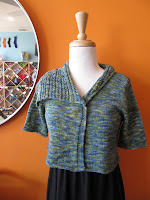 Five very wearable tops. Three pairs of socks (only one pictured). Six hats (only two pictured). Eight me-sized cardigans (one frogged; only seven pictured). 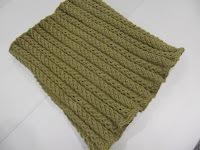 Four cowls. 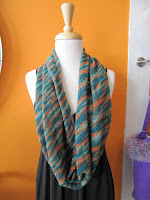 One shawl (just one!). One baby sweater and one baby blanket. 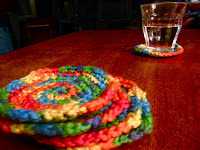 One set of dish scrubbies and one set of coasters. One pair of mitts (not pictured). 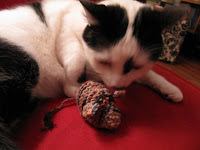 And one catnip-filled mouse for Howard. 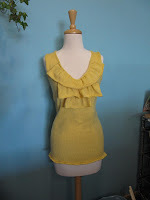 I have one other design that's been nearly finished for over six months! My goal for 2012 will be to release four designs - with one of them virtually finished already, hopefully that will be very do-able. But more on that once it happens. 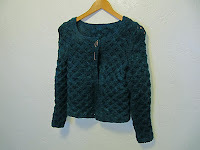 I think for 2012 my goal is to complete more long-sleeved pullover sweaters for myself, since it seems that is an area where my wardrobe is lacking. 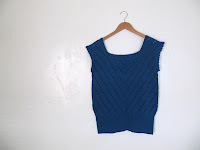 Plus a few more summery tops to round out that bit of my hand-knitted wardrobe (preferably with short or elbow-length sleeves, since most of this year's tops were sleeveless). I'd also like to be more serious about spinning in the coming year. I've dabbled a bit, and I have some lovely drop-spindles that I have really enjoyed, but I might save my pennies to splurge on a wheel. Maybe.